← The Hamma Bead Solution. 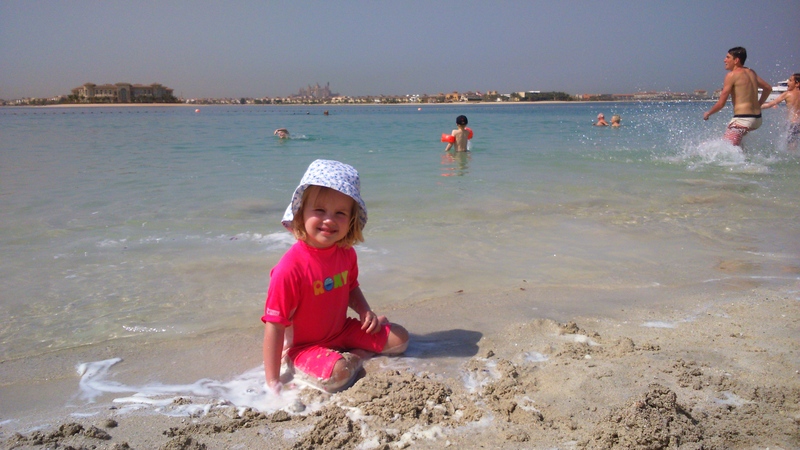 A Review of Tots Too and the Anantara Apartments Dubai, The Palm. 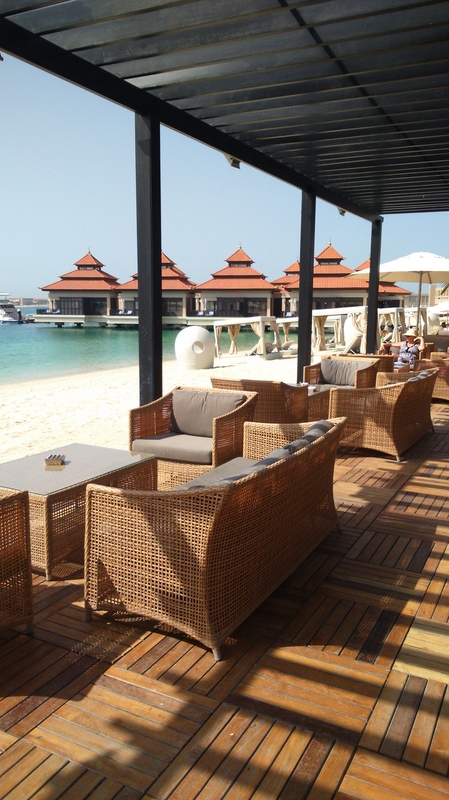 This year we decided to go away for February half term and we also decided we really wanted to be warm, so, as Ferg’s brother lives in Dubai with his lovely wife, we decided to go there. 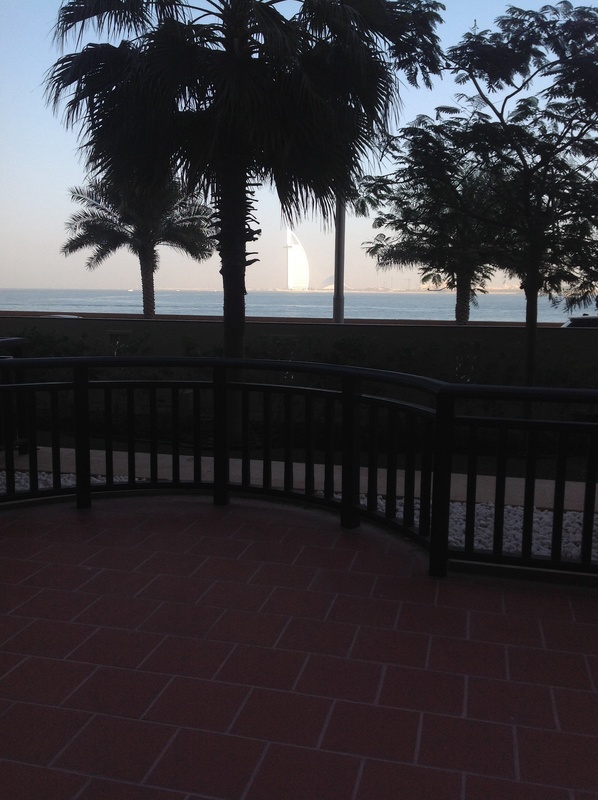 Last time we went, we stayed at the truly impressive, Atlantis hotel which is also on the Palm. The Atlantis is bonkers. It has a water park, an aquarium, several pools, a small shopping mall and lots of restaurants. When we had two kids it was fine, but with three it’s really hard to get a room big enough to fit us all in or a suite that doesn’t break the bank. To be honest, I was struggling to find availability as well, as we were trying to book in December for travel in February. I had no idea, holidays to exotic places were so popular in February, but they are, so don’t be caught out if you also decide to travel then. Anyway, I’d been receiving mailings from Tots Too for a while so decided to see if they could get us anything suitable. They were fabulous. I dealt with one person, a lovely, patient lady called Helen who did all the hard work for us. Tots too aim to provide, “Tailor made, luxury family holidays and child friendly resorts.” What I liked most is that they only recommended hotels that could definitely meet our needs. So for example, I asked if they could get us a suitable room in the Atlantis and she said all she could do was ask for an interconnecting room, they could not guarantee it. Bearing in mind how busy the half term week seemed to be, I would NOT have liked to leave that to chance. Imagine turning up at your hotel after nearly eight hours on a plane to find that one half of the family is on one side of the corridor and the other on another. No thank you sir. The idea of leaving anything so important to chance when you have young children, is not an option. 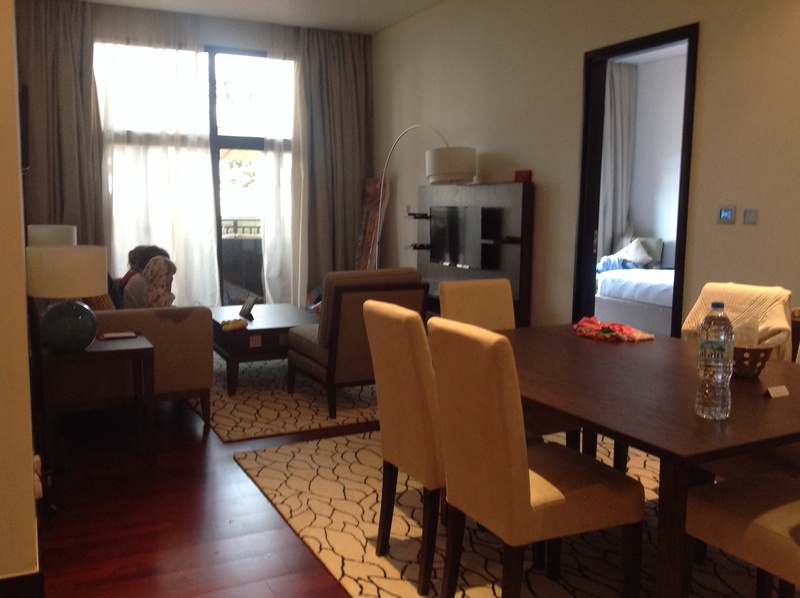 Helen sent us through a list of suitable hotels that either offered interconnecting rooms or 2 bedroom apartments. All the hotels she showed us had a kids club and a sheltered play area, they also all had lovely pools. Initially we wanted to go for the Sofitel Apartments on the palm which looked gorgeous (also had a water slide in one of the pools) but that got booked up before we got a chance to make a reservation. 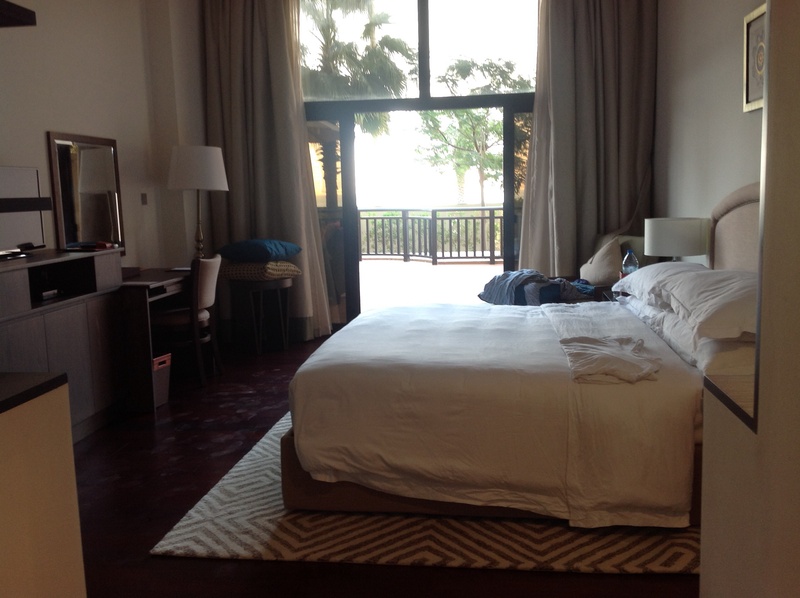 The next we looked at were the Anantara Apartments which I can tell you, were fantastic. On arrival, we were shown to our apartment which is a short walk from the main body of the hotel. 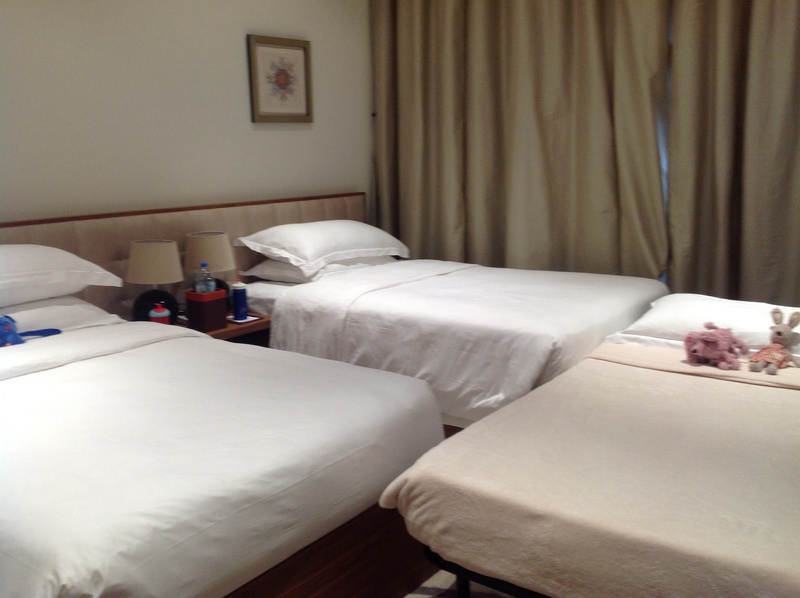 The service was fantastic and so, soon after arrival we were shown to our room. The apartment itself was beautiful. We had a large dining/sitting room, a small kitchen, two separate bedrooms (both with an en-suite bathroom). For us, this was pure luxury. To have that much space in such a beautifully designed room, made me feel straight away that this was going to be a great holiday. However, all was not quite perfect in paradise. When we opened the curtains and looked beyond our balcony, we were confronted with a gigantic, dusty building site, complete with humming machinery and bright lights. Bugger, so very nearly glorious! Anyway we decided the building site wasn’t so bad as we’d spend most of our time by the pool and didn’t bother complaining. We just ordered room service, ate in the room and toddled off to bed. At 7am we were woken up by the sound of heavy machinery. It was at that point I complained and requested another room. To their credit, they managed to find us another room by the end of the day and were supremely apologetic. From that point on I had no other complaints, it was all good. 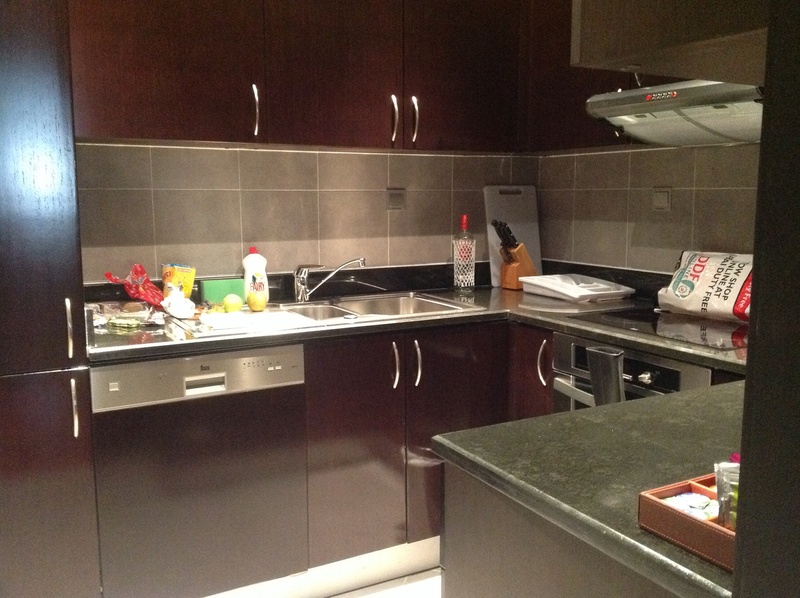 Here are some images of the apartment we ended up in. The apartments themselves are slightly separate from the the actual hotel but still on the same site. This wasn’t a problem though, part of the lagoon was just outside the exit of the apartment building which is also where the apartments have their own gym. The lagoon area outside the apartments. To reach the hotel lobby, you walk from the apartment building through various lanes that go through the lagoon accommodation. If you were feeling particularly fatigued you could call for a golf buggy to pick you up and take you to the other side of the resort. We didn’t do this as the walk was very quick. 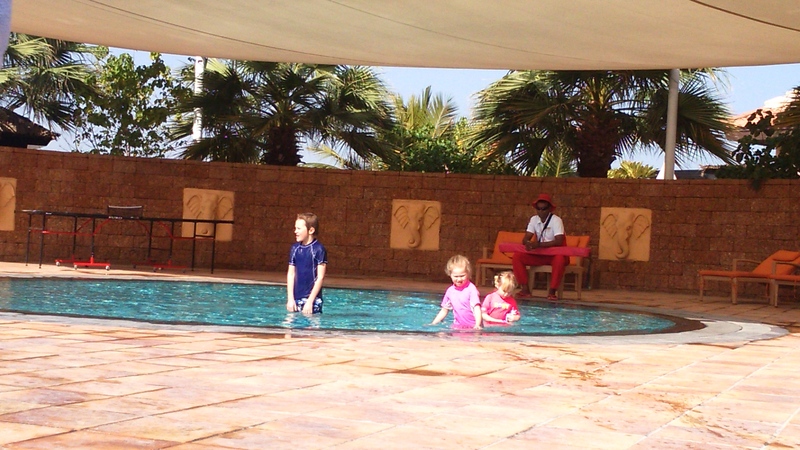 The main pool was lovely, not hugely deep so good for little ones as well as those learning to swim. There’s a jacuzzi area on one side and a baby pool on the opposite side. The view of the pool from my knees. The Pool area at sunset where the staff mark the end of the day with drums and hooting! The beach, although man-made was lovely with plenty of tiny shells in the sand. It had a great view of the Atlantis hotel, and at various points during the day there were activities such as football and volleyball for the kids to get involved in. There were also plenty of water activities to choose from, including waterskiing, wind-surfing, pulled water rings and pedalos. The beach with the Atlantis in the background. The Beach Bar where we often had lunch. Despite the fact that 3 out of five of us got ill during our stay, I thought the holiday was amazing! (I wasn’t one of the ill ones…) the food was great, the service impeccable, the facilities top-notch. I did wish there was a water slide in the pool, but to be honest, the kids just loved what was on offer. We only used the kids club once, but it was great. There’s a mini pool, sand pit, lots of activities, films to watch and computer games. They also offer an excellent baby-sitting service so if you fancy a meal alone, where you actually finish some sentences then be assured the babysitters who are also part of the kids club, are friendly, sweet and experienced. I have to say that the weather was also phenomenal with a high of 36 degrees during our stay which was in mid-February. There was a sand storm on the day we left and although it was very exciting and fascinating to experience, it meant our flight was delayed for three hours. Ho hum, when are long flights ever easy with three kids? 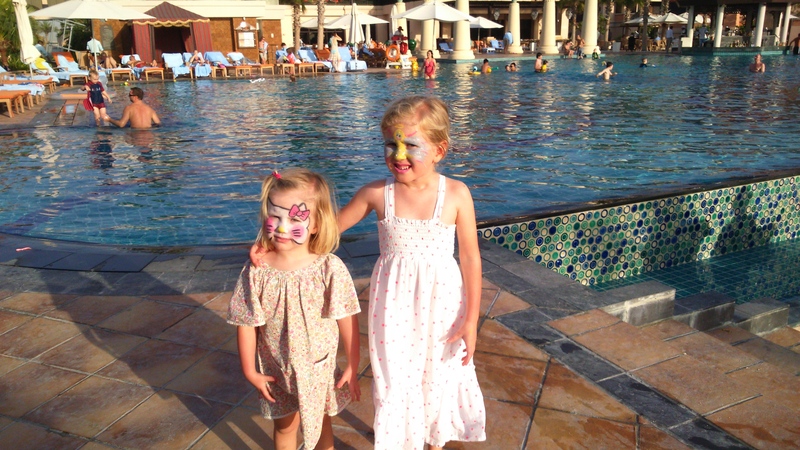 I would definitely recommend the Anantara Apartments if you have kids. They’re large, comfortable and feel very luxurious. 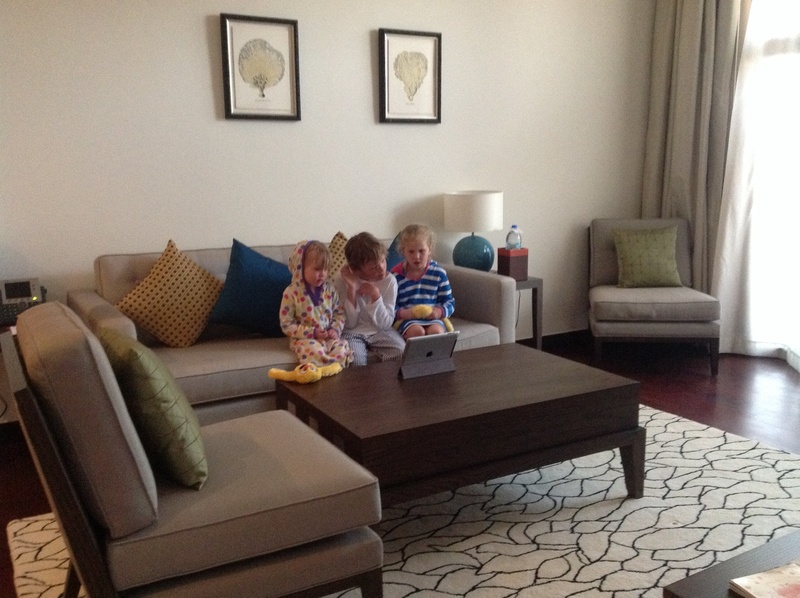 You have all the benefits of being part of the hotel but with more space and facilities for all those family needs. There’s always the danger you’ll end up overlooking a building site if you holiday in Dubai, so just make sure you ask at check in for a room away from any possible building work. Tots Too were also fantastic, make sure you talk to Helen if you call them. She Rocks. 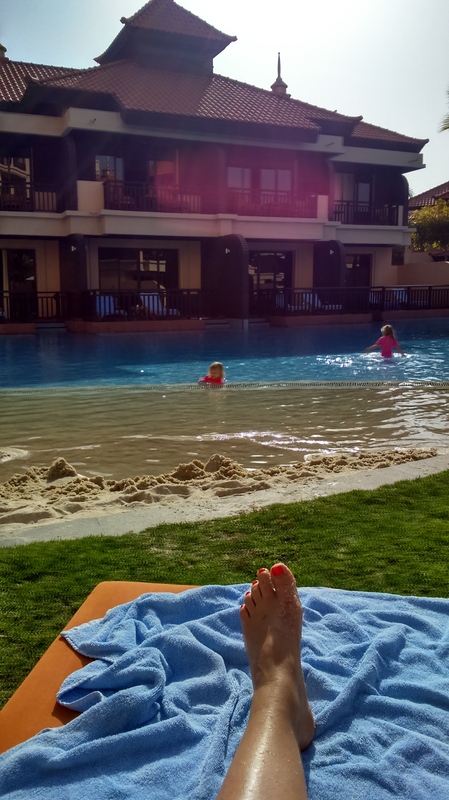 Posted in Holidays, Hotels, Motherhood, Parenting, Reviews, uncategorised	| Tagged Anantara apartments Dubai, pictures of the Anantara apartments dubai, review of the Anantara Apartments Dubai, tots Too. 6 Serious Childhood Conditions Triggered by Over-use of the iPad. The, “Do It Yourself”, 2.5-3 Year Development Assessment. Seriously?? My Big Fat 1930s Refurb. A Diary Of My Efforts to Redecorate Our House On a Budget.